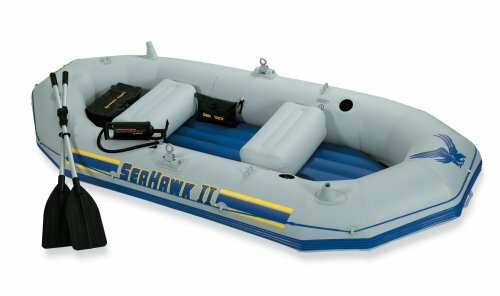 The Intex Seahawk II seats three people and comes with oars an inflation pump gear pouch and battery pouch. It features two air chambers for safety all-around grab rope grab handles on both ends two fishing rod holders inflatable floor for comfort and rigidity welded rotational oar locks and U.S. Coast Guard I.D.The Seahawk II has two Boston valves on the main hull chamber for quick-fill and fast deflation. The SUPER-TOUGH construction is triple strong made with 3 separate layers of material for extra strength and durability- two outer layers of heavy-gauge PVC laminated to an inner layer of polyester mesh for extra reinforcement.Features grab line around the entire boat, inflatable floor for comfort. Two fishing rod holders, 2 inflatable seat cushions, 1 gear pouch and 1 battery pouch. Grab handle on both ends, welded-on rotationary oar locks. Oar holders 54-Inch aluminum oars, high output pump 3 person, 660-Pounds capacity- U.S. Coast Guard I.D. Dimensions 117 x 50 x 18-Inch.